Organizations and professionals of all sizes and kinds rely on SQL Server databases to power their business. You may be managing multiple databases for your clients or you may be an admin managing your organization’s database, security and backup are the most important concerns on your mind. Imagine if you were able to schedule backups, monitor the backup process, monitor the health of your Servers, and do all this using the web or app. Sqlbak is a proven application that can let you do all this with prices starting from just $6 a month. It even allows you to choose the storage device where you want the backups to be taken – including the Cloud. 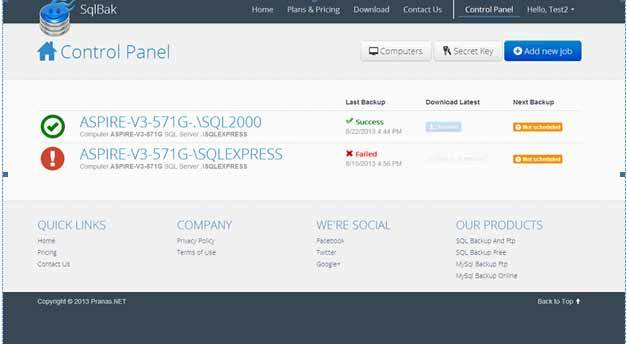 This review explores the key features and functions of this progressive SQL Server database backup application. This is the primary purpose of Sqlbak. 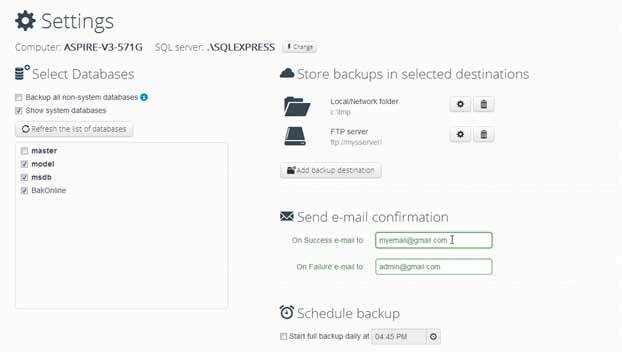 You can schedule backups of your server databases and it will automatically take care of it. At the same time, the software will alert you about the success or failure of the backup so that you can take appropriate action if required. 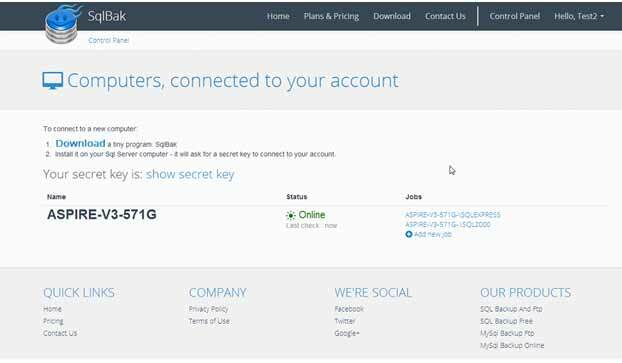 Once you have created an account, you can access the dashboard from any web browser. Schedule SQL backups or restore them with convenience. Other Cloud storage options are available to Standard account users ($6 per month per server), but the Amazon S3 option is available only to Professional account holders ($9 per month per server). You can also sign-up for a FREE account that allows backups on FTP, local drive and external drive. Sqlbak is designed to do much more than taking backups. It will also check your SQL Server’s health on a regular basis and generate periodic status alerts. The status alerts are generated every few minutes starting from 60 minutes (free account) to 5 minutes (for a Professional account). The alerts are sent to your email inbox. So if you ever notice that the server is down, you can take immediate action. There are many reasons why you should choose Sqlbak over other applications. Setup requires nothing more than installing the client on your Server. There is no need for directly accessing the SQL Server. It can be configured using the web browser. Setup doesn’t cost you additionally. You can monitor and manage up to two databases for free. The feature-packed paid accounts also start from tiny monthly payments. When it comes to security, you don’t have to worry about firewall configuration on the server. Communication is initiated from the Server side to Sqlbak.com through the highly secure (https) connection. Sqlbak offers a high level of versatility in terms of storage platforms where backups can be taken. You can take backups on a local folder, network folder, external drives, NAS, FTP, and the leading Cloud services including Google Drive, Dropbox, OneDrive and Amazon S3. Sqlbak also has a built-in private label (white label) solution for your clients. There are many advantages of using Sqlbak over the other products available in the market. With Sqlbak, there is no need to login into to your SQL Server for managing and restoring backups. You can do this using the browser and without putting your Server’s security at risk. Another advantage it offers over most competitors is that it instantly notifies you if the application’s own service is hampered. Most other software goes silent if their own service is affected. Sqlbak multi-SQL Server management feature is elaborate. The dashboard allows you to view all your Servers at the same time and you can also take actions simultaneously. There is no need to login into each server separately to do so (which is the case with most other applications). Even the performance monitoring and alerts system are unique to Sqlbak. And you get all these features for a tiny amount starting from just $6 a month. This application provides a level of versatility and series of features that are hard to find at this price point. Whether you have a single server or a large number of servers for different clients, this software allows you to manage and monitor them with ease from one place.